Recently, while moving into a new house, Elizabeth Gilbert unpacked some boxes of family books that had been sitting in her mother's attic for decades. Among the old, dusty hardcovers was a book called At Home on the Range (or, How To Make Friends with Your Stove) by Gilbert's great-grandmother, Margaret Yardley Potter. Having only been peripherally aware of the volume, Gilbert dug in with some curiosity, and soon found that she had stumbled upon a book far ahead of its time. In her workaday cookbook, Potter espoused the importance of farmer's markets and ethnic food (Italian, Jewish, and German), derided preservatives and culinary shortcuts, and generally celebrated a devotion to seeking out new epicurean adventures. Potter takes car trips out to Pennsylvania Dutch country to eat pickled pork products, and during World War II she cajoles local poultry farmers into saving buckets of coxcombs for her so she can try to cook them in the French manner. She takes trips to the eastern shore of Maryland, where she learns to catch and prepare eels so delicious, she says, they must be "devoured in a silence almost devout." Part scholarshe includes a great recipe from 1848 for boiled sheep headand part crusader for a more open food conversation than currently existed, it's not hard to see from where Elizabeth Gilbert inherited both her love of food, and her warm, infectious prose. 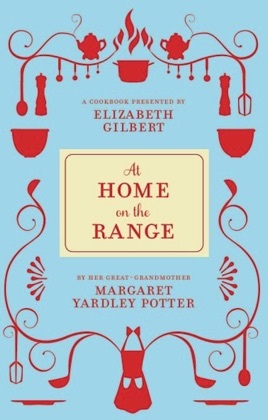 Featuring a comprehensive and moving introduction from Potter's great-granddaughter, Elizabeth Gilbert, At Home on the Range is an eminently usable and humorous cookbook. But it's also more than that: it's an heirloom, an into-the-wee-hours dinner with relatives and ancestors, a perfect gift for anybody with a stove or a mother. 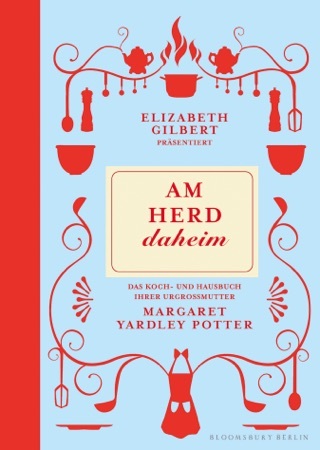 Author Elizabeth Gilbert (A Skeptic Makes Peace with Marriage) does a wonderful service by bringing back the opinionated, modern-for-its-time cookbook of her eccentric great-grandmother Gima Yardley Potter, first published in 1947. A woman who came from a wealthy Main Line Philadelphia family, married a profligate lawyer in the plentiful 1920s, and gradually had to come down in the world, Gima discarded the cook within the first three years of her marriage and energetically took charge of her own kitchen, learning from trial and error the art of entertaining myriad surprise guests her husband brought home and generally making-do while keeping everybody happy and well fed. Her upbeat tone that so impressed Gilbert when she finally read the cookbook braces the reader delightfully, from Gima s merry use of calf s brains and cockscombs ( with wine ) to relaying how to make what was then a rather curious, palate-wowing ethnic find called pizza. Chapters are devoted lovingly to what foods best to bring hospitalized friends, mastering cocktails, and organizing emergency meals and effortless entertaining. In her bright, determined tone ( Is your cigarette finished? Let s go ), Yardley Potter assures us a generation before Julia Child that we can tackle bouillabaisse, preserves, bread, and grandmother s sacred sponge cake.